2018 has flown by, and we have so many things to be thankful for. 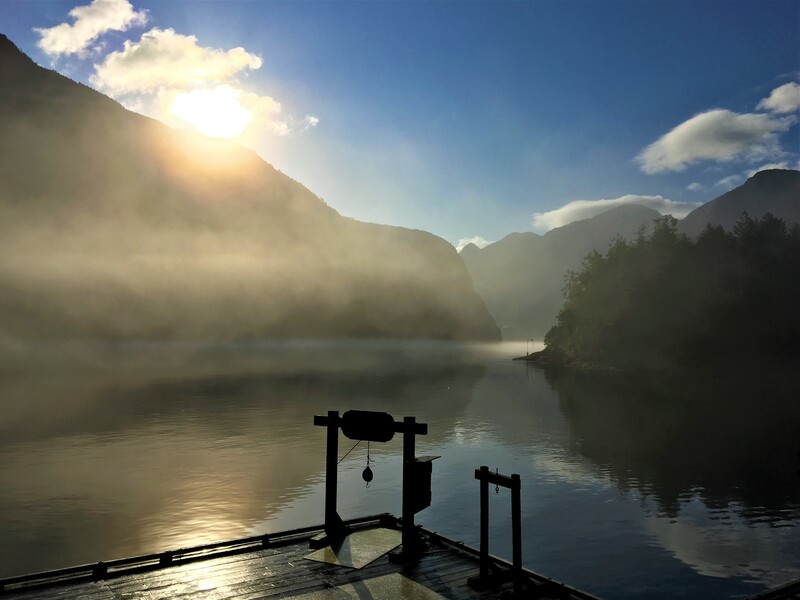 Fishing has been absolutely fantastic, the weather has been more than kind, and our guests have once again enjoyed what I personally believe are some of the most productive and picturesque fishing grounds on the entire west coast. Even into September we are still seeing chinook coming through the usual routes. No-Name and Denham Bay are still producing nice fish into the 30+lb class. Bait schools are consistent and prolific in these areas and are still drawing fish in to feed on their journey south. Both the South and West Pinnacles are also holding chinook, and some nice late season chum salmon are being taken too – GREAT for the smoker! As mentioned last week, three generations of the Gabel Family spent a trip with us and were having a blast. 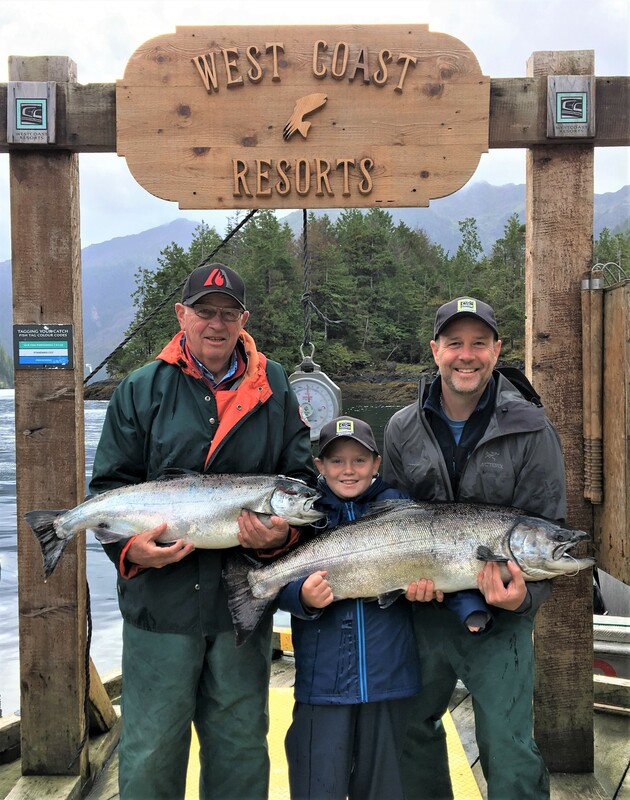 As icing on the cake, while trolling Denham Bay with their guide Cyrano, Brad Gabel hooked and landed an awesome 34lb chinook with a bunch of help from his son Aiden, and excellent supervision from Dad Harry. It doesn’t get much better than that – congratulations guys!!! I’m sure stories from your trip will get some mileage now that you’re home. 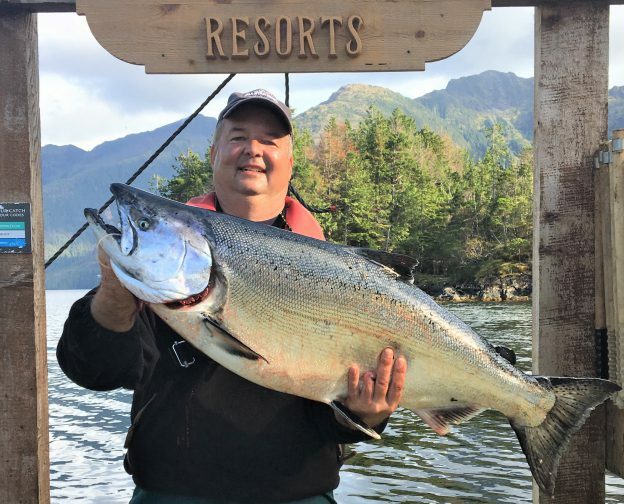 Andre Alberts also got in on the Tyee action, landing a chunky 36lb chinook on the Shoals with his guide Damian “Hummae” Brown. Great fish Andre! Coho are really swarming on our northern grounds. At this time of year, they are really bulking up and most fish are in the 10-16lb range now. Extremely hard hits and acrobatic aerial fights are keeping anglers busy providing a ton of fun and some excellent table fare. If anyone says they can’t catch one of these silver bullets they obviously don’t have a hook in the water! It seems like the giant schools of herring on and around Denham Shoals are expanding daily. Humpback whales continue to gorge themselves – building upenergy stores for their travels south, andnearly all the fish we are catching are stuffed with giant herring. The halibut fishing remains ridiculous, and many bottom fish species are being encountered mid-water while targeting salmon, coming off the bottom and feeding up into the herring schools, providing more variety while trolling. The days are getting shorter and the mornings cooler, definitely signaling the onset of Fall here on Haida Gwaii. Salmon are invading their rivers, bears are fattening up for their winter naps, and the bucks are shedding their velvet in preparation for some serious head to head combat. It’s truly amazing to see the seasons change and the cycle of life continue in one of Earth’s most amazing and abundantly rich eco-systems. Although our season is virtually over, we are all looking forward to planning for an even better 2019. There’s something special about breaking out a chunk of salmon or halibut for dinner in the middle of winter and having it bring all the memories back of your trip and catching that exact fish… I hope you’ve all secured your spots for next year! We’ll be ready to greet you as you get off the chopper and create a whole new experience and more great stories and memories. Haida Enterprise Corporation [HaiCo] focuses on building enterprises that reflect Haida cultural values, creating careers and improving the lives of the Haida people and the economy of Haida Gwaii.